Approved landowners will receive up to five wood duck boxes along with predator shields. Up to five boxes per applicant will be available for distribution throughout the state. The application deadline is Nov. 1, 2018. All applicants will be notified as to the status of their application by January. Approved applicants will be supplied with a wood duck box and predator shield. Each box also requires 4″x 4″x 10′ post along with the hardware for mounting the box and predator shield. Posts and hardware may be purchased at local lumber yards and home improvement stores. The wood duck is the most important species to South Carolina waterfowl enthusiasts and is the only duck for which we can effectively manage production habitat throughout all geographic regions of the state. The SCDNR’s Wood Duck project supplements natural production in cavities of forested wetlands by providing artificial nesting sites. Fewer natural cavities are available today due to human activity and development. Through this project, private landowners are able assist the SCDNR to produce thousands of wood ducks annually. 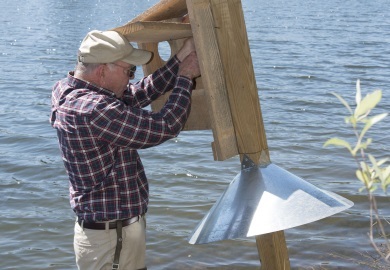 Click here to apply for wood duck boxes.